to continue research on black corals, sponges and other habitat-forming invertebrates. Submersible dives to address the goal of comparing submersible- and ROV-collected data were conducted in the marine protected areas off Gull Island, which is along the southern side of Santa Cruz Island, at the Footprint Ridge, Piggy Bank, in the Santa Cruz-Anacapa Island Passage, and on the north side of Anacapa Island. The surveys were made along the tracks set up by the ROV personnel and during the surveys researchers were able to essentially duplicate the path of the ROV that had been made a few weeks previous. The team performed approximately 16.5 kilometers of transects inside the Anacapa Island Reserve using standard submersible survey methods as well as methods used with the ROV. They also performed approximately 14.5 kilometers of transects inside the Gull Island reserve, again utilizing both Delta and ROV methodologies. 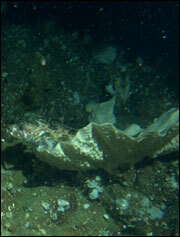 Comparisons of the data collected using both transect techniques, as well as data collected by ROV, are being made and will be reported in the near future. The report will outline the two types of transect techniques used with the Delta, compare estimates of species richness, abundance and size structure between these two techniques at the two MPAs and summarize the strengths and weaknesses of each technique in monitoring marine protected areas. The second goal of the project involved conducting baseline surveys at the Footprint Ridge and Piggy Banks. 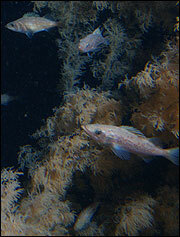 Both banks have been nominated as federal marine protected area sites. Dr. Love and his team have surveyed these two rocky areas for the past few years and have found that they contain excellent habitat but they harbor relatively few large fishes. During the October cruise, the team also was ground truthing habitat maps generated using sidescan sonar by Dr. Guy Cochrane of the US Geological Survey. The final goal of this project was to continue research on black corals, sponges and other habitat-forming invertebrates. Toward this end, researchers collected and surveyed the newly described deep-water black coral, Antipathes dendrochristos, the Christmas Tree Coral. This coral is relatively abundant on the Footprint and the surveys are designed to help understand what habitats this species occupies and whether the coral and other large invertebrates such as sponges form habitat for fishes. This year researchers collected several small colonies of coral for ageing studies to determine if this species, like other deep water corals, is long-lived. Other highlights included video and photo documentation of three extremely rare rockfishes (the bronze-spotted, chameleon and semaphore rockfishes) inside the proposed Footprint MPA and the discovery in the CINMS of a deepwater skate nursery ground containing thousands of eggcases.